Graduate student Sharon Forinash created the following digital trailer for Spinster Goose; Twisted Rhymes for Naughty Children by Lisa Wheeler. It's so clever (actually both the book and the trailer are so clever)! Check 'em out. And Veronica Grooms created a readers' guide for Spinster Goose full of fun activities. Check it out! 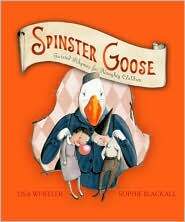 In this delightfully sinister twist on Mother Goose, Lisa Wheeler has given us her recreated and reimagined parodies of the traditional Mother Goose rhymes by introducing a new character, Mother Goose’s sister Spinster Goose. When faced with the naughtiest, most rotten children around, Mother sends them on to her stern sister Spinster who rules over a prison-like school for wayward children. Here we find every manner of brat: the pinchers, pokers, biters, takers, swearers, cheaters, liars, and more! We have new delinquents along with some familiar ones like Jack and Jill, Georgie Porgie, Mary Quite Contrary, and Humpty Dumpty. Warning! Watch your manners. If you are not careful, “She’ll box and wrap each little brat/ and send them home to you!” Reminiscent of the horrid adults and situations in the books by Roald Dahl. Each poem is accompanied by morbid little pictures done in watercolor and ink. Sophie Blackall’s illustrated children are every bit as unique and recognizable as the artwork of Edward Gorey and Tim Burton. A standout aspect of her illustrations for the book is that her characters are truly whimsical—some human and some part animal. Georgie Porgie, for example, is a bullying bulldog picking on two cherub-faced little preschoolers. The rhymes and illustrations in this book are a perfect combination to tell the story of these beastly boys and ghastly girls. This will appeal to children and adults who like things slightly strange and off-center. This collection of Mother Goose parodies . . .is as elegant as it is, like Mary, “quite contrary”….Blackall’s pallid vignettes balance chilly poise and mordant humor. . . Wheeler adds some intellectual depth to the original nursery rhymes while grossifying them. . .kids with a twisted sense of humor will feel right at home. 1. Has anyone heard of Mother Goose? 2. Do you know any Mother Goose rhymes? 3. Would you like to share and recite the rhymes you know? 4. What do you think of Mother Goose? How do you picture her? 5. Looking at the cover of Spinster Goose, does this look like Mother Goose? Who do you think this is? Does she look kind or mean? Why? 6. What is a spinster? What do you think of when you hear that word? 7. Why is she holding the children like that? What kind of children are they? • The children could be encouraged to read a rhyme as a duet. A perfect example would be “The Interrupter” by Lisa Wheeler (Spinster Goose). This rhyme has alternating lines: the actual rhyme and then the interjections of the character Mary (Mary, Mary, quite contrary). One child could narrate the rhyme, the other could play the part of Mary. The part of Mary would need to sound like an annoying know-it-all! • Let the children read their favorite rhyme from Spinster Goose using several different accents, emotions, and tones of voice. For example, “Crooked Row” could be read with a very proper, upper-crust British accent, with a scary, sinister voice, or with a cheerful, peppy voice similar to the Good Witch in the Wizard of Oz movie. Let them have fun and experiment with how one’s voice can change the presentation and characterization of the poem being read aloud. Question: Which brand of gum makes the best bubbles? Come up with a hypothesis. Do the kids think that more sugary gums make the best bubbles? Does the color of the gum matter? Etc. Using at least 6 brands of bubble gum, have teams of students chew and blow bubbles. Time the length a bubble lasts before popping or deflating. Which gums made the strongest bubbles? Biggest bubbles? Longest lasting bubbles? Chart the results and compare with the other teams. Question: How long will it take chalk to dissolve? Observe. The chalk will begin dissolving and be completely dissolved within a few days. Parody: a piece of writing, music, etc., that imitates the style of someone or something else in an amusing way. Compare this parody with the original poem. *Note that the entire book, Spinster Goose: Twisted Rhymes for Naughty Children is a parody of Mother Goose. Using “Mary Had a Little Lamb” as a pattern, write a new poem. His/her _______ was ________ as _______. / The_______ was sure to _______. Justin had a little fish. Her scales were blue as water. The fish was sure to totter. Addams, Charles. 2002. The Charles Addams Mother Goose. New York: Simon & Schuster. Burton, Tim. 1993. The Nightmare before Christmas. New York: Disney Press. Cole, William. 1964. Beastly Boys and Ghastly Girls. Ill. by Tomi Ungerer. New York: Philomel Books. Gorey, Edward. 1997. The Gashlycrumb Tinies. New York: Houghton Mifflin Harcourt. Note: This is an adult children’s book. Recommended for older readers. Holub, Joan. 2008. Knuckleheads. Ill. by Michael Slack. San Francisco: Chronicle Books. Pichon, Liz. 2008. The Three Horrid Little Pigs. Wilton, CT: Tiger Tales. Sierra, Judy. 2001. Monster Goose. Ill. by Jack E. Davis. New York: Harcourt, Inc.
Visit the author’s website for more information about her and her books. Visit the illustrator’s website for more information about her artwork and projects. The rhymes, recommended books and resources, coloring sheets and how to share rhymes with children. Games, crafts, activities and more with Mother Goose rhymes. Mother Goose rhymes, recipes, and information. Mother Goose rhymes in rebus form, a combination of pictures and words. Mother Goose rhymes and various links to other websites. Background information on the history and origins of Mother Goose. Lisa Wheeler is the twisted author of more than twenty-five books for children, including Boogie Knights and Seadogs: An Epic Ocean Operetta, both illustrated by Mark Siegel, and Sailor Moo: Cow at Sea, illustrated by Ponder Goembel. She lives in Michigan with her nice husband and naughty Border Collie. “Writing books for children is definitely a dream come true. I am doing exactly what I am supposed to be doing with my life. Just like when I was a child in Pennsylvania, I love everything about children's books -- even the smell!" Sophie Blackall is an Australian illustrator whose previous books include Ruby’s Wish, Meet Wild Boars, and the Ivy and Bean series. She lives in Brooklyn, New York, with her impeccably behaved children and poorly behaved cat. Rackham, Arthur. 1913. Mother Goose Nursery Rhymes. New York: Franklin Watts, Inc.
Used with permission of Sharon Forinash and Veronica Grooms. My students Susan Corbitt and Katie Allen created this comprehensive readers' guide for The Green Mother Goose by Jan Peck and David Davis. Lots of great ideas here! New York: Sterling. ISBN 9781402765254. 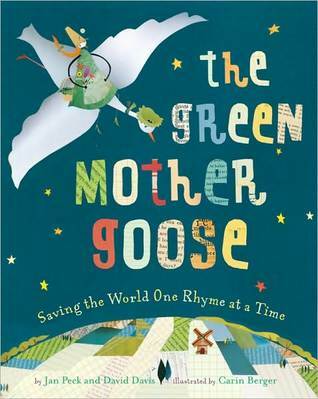 Mother Goose has gone green in this recycled book of 30 familiar Mother Goose rhymes. Jack Pratt addresses healthy eating in this new green version where he eats junk food fat and outgrows his pants. This Little Piggy saves water, bikes, uses alternative energy and squealed “Re-re-recycle!” all the way home; Mother Hubbard shops with cloth grocery bags. This eco-friendly picture book introduces recycling, organic gardening, free-range chickens, alternative energy, and protecting the environment to children through the use of nursery rhymes. The illustrations further the eco-friendly theme by creating collages from ticket stubs, newspapers, and other reused items. The book is printed with soy-based ink on paper made from mixed sources including recycled wood and fibers. Are you familiar with Mother Goose Rhymes? Have the original Mother Goose book to show students. Read some of the poems if they are not familiar with them. Recite some if they know them. Do you turn the lights off when you leave your room? Did you know you can save energy when you turn the lights off? How else can you save energy in your home? Do you know what recycling is and does your family recycle? “Here We go Round the Neighborhood” - Invite the entire group to sing along with you. The author took original Mother Goose Rhymes and made them “Green”. Invite the children to explore other Mother Goose Rhymes and choose one that they could recreate into an eco-friendly version. In groups, have the children think of other eco-friendly topics to write about. Have each group create an original poem about their topic. Invite the children to research one of the science theme from one of the poems; such as, recycling, energy conservation, water conservation, or nutrition. Have the children report on their new knowledge about the theme. Invite the children to start recycling at home and share their experiences. Invite the children to collect used materials from their home and create a “recycled” pet from those items. The illustrator used pieces of old newspaper, bottles, and cans to create many of the illustrations in the book. Invite the children to use these items to create a collage of their favorite poem. Offen, Hilda. 1984. A treasury of mother goose. New York: Simon and Schuster for Young Readers. DePaola, Tomie. 1985. Tomie DePaola’s mother goose. New York: G.P. Putman’s Sons. Decker, Marjorie Ainsborough. 2001. The Christian mother goose book of nursery rhymes. New York: Penguin Putman. Still, James. 1998. An Appalachian mother goose. KY: University Press of Kentucky. Jablow, Renee. 2011. Hey, that’s not trash! : but which bin does it go in? New York: Little Simon. Bethel, Ellie. 2008. Michael recycles. CA: Worthwhile books. Inches, Alison. 2009. The adventures of a plastic bottle: a story about recycling. New York: Little Simon. Inches, Alison. 2009. The adventures of an aluminum can: a story about recycling. New York: Little Simon. Inches, Alison. 2008. I can save the earth! : one little monster learns to reduce, reuse, and recycle. New York: Little Simon. Mayer, Mercer. 2008. It’s earth day. New York: Harper Festival. O’Connor, Jane. 2010. Fancy Nancy: Every day is earth day. New York: Harper Collins. Capucilli, Alyssa Satin. 2010. Biscuit’s earth day celebration. New York: Harper Festival. McNamara, Margaret. 2009. Earth day. New York: Simon Spotlight. Trucit, Trudi Strawn. 2007. Earth day. Chicago: Children’s Press. Wallace, Chad and Pattie Schnetzier. 2003. Earth day birthday. CA: Dawn Publishing. Murphy, Stuart J. 2004. Earth day – hooray! New York: Harper Collins. Martin, James II. 2008. William the garbage truck & crew: William is going green. CA: Dream Liaison. Kaplan, Madeline. 2008. Planet earth gets well. S. Carolina: Book Surge. Asch, Frank. 1994. The earth and I. CA: Gulliver Green. Schimmel, Schim. 1998. Children of the earth…remember. New York: Cooper Square Publishing. Brown, Marc. 2011. Arthur turns green. New York: Little, Brown and Company. Walsh, Melaine. 2008. 10 things I can do to help my world. Mass: Candlewick. Reilly, Kathleen. 2008. Planet earth: 25 environmental projects you can build yourself. VT: Nomad Press. O’Ryan, Ellie. 2009. Easy to be green: simple activities you can do to save the earth. Utah: Simon Scribbles. Glaser, Linda. 2010. Garbage helps our garden grow: compost story. Minn: Millbrook Press. Glaser, Linda. 2010. Our big home: An earth poem. Minn: Millbrook Press. Vanderwood, Jill Ammon. 2009. What’s it like living green? : Kids teaching kids by the way they live. S. Carolina: Book Surge. Jan Peck is an award-winning children's book author. She has also written for magazines, including Boys' Life, Highlights for Children, Humpty Dumpty and Turtle magazines. Jan is an organic gardener and a past cook for Auntie Em's, a vegetarian health-food restaurant in Cowtown. Her latest traditionally published picture book is The Green Mother Goose, co-written with David Davis. Jan is a member of the Society of Children's Book Writers and Illustrators, and the past Regional Advisor for the North Central/ Northeast Texas Chapter. Jan has won many awards for her writing. Her website is http://www.janpeck.com. David Davis is an author, cartoonist and speaker. He grew up in San Antonio, Texas and currently lives in Fort Worth, Texas. In addition to his books, David has published pen-and-ink artwork, cartoons, poems, humor, and short stories in various magazines and newspapers. Davis is a member of the Society of Children's Book Writers and Illustrators. He is an active speaker and presenter at educational conferences and schools, including LeTourneau University, Baylor University, and Texas A&M at Corpus Christi. He's been a featured author at the Texas Library Association Convention, and the Texas Book Festival. His website is http://www.daviddavis.com. Here is a second readers' guide with additional ideas and activities created by graduate student Katie Allen. This collection of 30 eco-friendly poems serves up a new twist on many classic nursery rhymes and songs. Throughout the collection, the reader encounters The Green Mother Goose, who yearns to save “our emerald home,” fuel conservatives Yankee Doodle and Little Boy Green, and Little Jack Horner, who replaces his mother’s light bulbs to lower her bills. The reader also meets many characters who are, well, not-so-green. Mary, Mary Quite Contrary grows her garden with chemicals and toxins, while Old Mother Hubbard keeps her cabinets stocked only with junk food. Conservationist Jack Be Nimble can teach readers to turn off the tap water while brushing, turn off lights before leaving a room, and hang laundry out to dry. Readers will be disappointed to learn of Humpty Dumpty’s fate after global warming, but they will learn the importance of eating healthy foods from Jack Splat and his wife. Little King Pippin shares energy-saving tips for building environmentally friendly houses, and the Three Little Pigs “Re-re-recycle” all the way home. The beautifully collaged illustrations, made with found materials, add a whimsical feel to the recycled pages, which are printed using soy-based ink. “Peck and Davis whimsically rework 30 familiar rhymes with eco-friendly issues and concerns: recycling, organic gardening, free-range chickens, and the benefits of conserving. The five little piggies bike, save water, and cry: "'Re-re-recycle! '/All the way home." Little Jack Horner changes incandescent bulbs, Little Boy Green tends a beehive, and Old King Coal: "Though he was a meanie,/Now he is a greenie,/And he works to keep our skies smoke-free." Most of the rhymes are fun and readable, even rousing at times, though a few are forced and didactic. After failing to win her pet's approval with junk food and nonorganic snacks, Old Mother Hubbard: "...went to the market/To buy only local./Dog bounced and barked,/His approval was vocal." 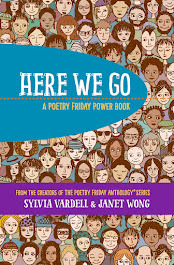 Discuss the following questions with your storytime group or class before reading selections from this poetry collection. - Are you all familiar with Mother Goose poetry? If so, would any of you like to share a favorite Mother Goose poem. - What do you think the word “green” means in this poetry collection? Look closely at the illustrations on the book’s front and back cover for clues. Are there any “green” activities depicted on the covers? - What kinds of “green” activities are you doing at home or at school to be environmentally friendly? - What do you think might happen if we stopped taking care of our planet? - “Yankee Doodle” – Turn this song into a singing poem! Sing the original “Yankee Doodle” song before beginning this activity to familiarize readers with the tune. Split the readers into 4 groups, and assign each group one verse and a chorus to sing together. Share the song with parents or other children to spread the importance of saving fuel. “Here We Go Round the Neighborhood,” “If All the Seas Were One Sea,” and “Hickory Dickory Dock” would also work well as singing poems. - “Jack Be Nimble” – This poem can be read as a chorus poem. Have the children repeat this first line of every stanza, “Jack Be Nimble,” while you read the rest of each stanza. - “There Was an Old Woman Who Lived in a Shoe” – This poem lends itself well to being read in the “line-around” style. Write each of the 12 lines on a numbered index card, and pass the cards out to volunteers who are comfortable reading aloud. Have the children share the poem by lining up and reading their cards from 1-12. - “One, Two, We Can Renew” – This poem would work wonderfully if read in the “call and response” style. Split the readers into two groups. Group 1 will read the numbered parts of the poem, and group 2 will read the responses. o Provide a list of Mother Goose poems or nursery rhymes not included in this collection. Invite readers to change the words of a selected poem or song into a new, “greener” version. o Have students research activities they can do to make the Earth a healthier place to live. The students can each choose one activity, create a “how-to” pamphlet or flyer, and hand it out to friends and family. o Brainstorm as a group about aspects of your community that could be more eco-friendly. As a group, compose a letter addressing what can be done to help the community become more “green,” and send the letter to the appropriate location. o Create a worksheet with word problems centered around “green living.” The following are examples of word problems for the worksheet. ♣ If Wendell has three hens, and they lay two eggs per day, how many eggs would Wendell have after seven weeks? ♣ When the Bates family goes grocery shopping, they fill up four reusable shopping bags each trip. After five trips to the grocery story, how many plastic bags will they have saved by using their “green” shopping skills? ♣ The James family washes five loads of laundry each week. It costs $0.50 for each load of laundry dried in the clothes dryer. How much money would the James family save each month by hanging their clothes out to dry? o Encourage your students to create less waste. Weigh the garbage in the classroom or library at the end of each day. Discuss how students can reuse and recycle to create less waste. Hopefully the weight of the garbage will slowly decline as students reuse and recycle more often. o Grow a classroom or library garden. Plant flowers, vegetables, or herbs. Discuss the importance of healthy eating, and encourage children to pass their newly-learned habits on to their friends and family. o Make seeded paper bookmarks. This easy science/craft activity creates a bookmark that can be planted after use as a bookmark. Instructions for this activity can be found at the following website: http://crafts.slides.kaboose.com/336-spring-crafts/12. o Use found materials to create collages like the illustrations found in this book. Ideas for found materials include newspapers, old books or magazines, mismatched buttons, puzzle pieces, string, or fabric. Collages are great projects to clean out old craft materials without having to throw them away. o Make bird feeders! Use peanut butter or honey to coat a paper towel or toilet paper roll. Roll the covered roll in bird seed and cover completely. Hang the feeder from a tree, and enjoy watching the birds snack on the seed! Davis, David. Texas Mother Goose. Gretna: Pelican Publishing, 2006. Hansen, Doug. Mother Goose in California. Berkeley: Heyday Books, 2009. Maccarone, Grace. The Real Mother Goose Treasury. New York: Cartwheel Books, 2006. Berger, Carin. OK Go. New York: Greenwillow Books, 2009. Brown, Marc. Arthur Turns Green. New York: Little Brown, 2011. Child, Lauren. We Are Extremely Very Good Recyclers. New York: Dial Books for Young Readers, 2009. Kroll, Steven. The Dumpster Diver. Cambridge: Candlewick Press, 2007. Leedy, Loreen. The Great Trash Bash. New York, 1991. Muldrow, Diane. We Planted a Tree. New York: Golden Books, 2010. Perla, Victoria. When Santa Turned Green. Nashville: Thomas Nelson, 2007. Sierra, Judy. Ballyhoo Bay. New York: Simon and Schuster, 2009. Ziefert, Harriet. My Forever Dress. Maplewood: Blue Apple Books. 2009. Bailey, Jacqui. What’s the Point of Being Green? Hauppauge: Barron’s Educational Series, 2010. Johnson, Angelique. The Eco-Student’s Guide To Being Green at School. Mankato: Picture Window Books, 2011. Hirsch, Rebecca. Protecting Our Natural Resources. Ann Arbor: Cherry Lake Publishers, 2010. McKay, Kim. True Green Kids: 100 Things You Can Do To Save the Planet. Washington, D.C.: National Geographic, 2008. Reilly, Kathleen. Planet Earth: 25 Environmental Projects You Can Build Yourself. White River Junction: Nomad Press, 2008. Silverstein, Alvin. Smog, Oil Spills, Sewage, and More. Berkeley Heights: Enslow Publishing, 2011. Used with permission of Susan Corbitt and Katie Allen. Courtney Komar and Kendra Caskey both developed readers' guides for Emma Dilemma; Big Sister Poems by Kristine O'Connell George. Both offer a wealth of resources and connections for using this wonderful book with children. Here is Courtney Komar's guide. In this touching collection of 34 beautiful poems, the reader is introduced to the experiences that Jess and her younger sister, Emma share. Jess, portrays the range of emotions that she endures as she captures the hearts of the reader by sharing her struggles of being a big sister. Emma looks up to her big sister and often emulates Jess’s actions. She is a loving and supportive younger sister who always wants to tag along with Jess whenever possible. Jess, being the older sister is often frustrated by Emma but is confronted with a “dilemma” as she wants to be the best big sister possible. Jess often wants her space, as seen in the “Freedom” poem as she asks her mom to promise to “keep Emma out of our way” while she plays with her friend Sasha. When Emma breaks her arm trying to climb the tree Sasha and Jess are in, Jess is filled with an overwhelming sense of guilt, feeling as if Emma’s injury is her fault. As each story unfolds, the reader captures the emotional bond that Jess and Emma have while highlighting the significance of family. The incredible union that is shared between these sisters is immaculately presented by Kristine George as she conveys the tender emotions expressed by each character. Nancy Carpenter’s engaging illustrations bring each heartfelt experience to life through her use vivid of pastel-lined drawings. Together, this talented duo capture the meaning of sisterhood while delicately addressing the emotional impact that is sustained through our life experiences. What do you enjoy doing with your siblings? Do you ever feel frustrated with them? Do you enjoy spending time with them? Do you have a role model? Can you think of a time where you looked up to your sibling or your sibling looked up to you? Do you like collecting items or telling jokes with your siblings? Imagine that you have a younger sibling, would you like for them to tag along all of the time? Would you enjoy playing with them often and sharing your belongings with them? What type of roles do your older/younger siblings play? Do you look after each other and tell them your secrets? What type of influence does your family have on you? Do you consider yourself as a good big sister/brother? Are you the younger sibling? Do you enjoy tagging along with your older sibling? “Dracula” –Have each member read the poem chorally based on the part given. Assign every other line to a team so that they are responding to each other. For example, one side of the class would say “Scared you!”, and then the other side of the class would say “Scared you!” Next, one side of the class would say “Did not”, as the other side of the class would echo them and respond with “Did not” as well. The teacher would read the first and last sections of the poem to the class. “Not Funny”- Have two volunteers to act out the “Not Funny” poem, one would play Jess and one would play Emma as Emma tells her joke. Emma would begin by saying, “Knock Knock!” then Jess would reply with “Who’s there?” until the poem was demonstrated completely. This example could also be read by the entire class if they were broken into two groups as mentioned above. “Role Model”- Each child will pick a partner to work with. The first member will choose a different voice or accent to read the poem aloud to their partner. The next partner will have to mimic that accent as they read the poem back aloud to them. This activity will be done twice so that each partner has a time to share. For example, using a southern drawl, the child says “Emma copies everything I do, and sometimes I don’t do something I might do….” as the other member of the team listens and repeats the poem back using the same accent. • Jess discusses a field trip to the natural history museum along with a souvenir she bought for Emma. Have each child write about their favorite field trip they have ever been on along with a picture that coincides with that trip. If they cannot think of one, they are to write about one they would like to go on and why. What did you do? or What did someone do for you? Why did you feel bad in the first place? or Why were they feeling down that day? How did it make you feel after? or Were you able to help them out? • Dad in the book sometimes calls Emma “Emma Dilemma”. Invite the children to write about any nicknames they have in their family either for themselves or for other family members. Ask them to explain how this name came about. • Jess has had enough of Emma entering her room without permission. In “Justice”, her dad addresses this issue by putting a lock on her door so that only Jess can enter. Each child is to make their own key in art class. They are to use construction paper, pipe cleaners, and yarn depending on how they would like their key to look. As an extension, they could a short description of their design along with who they would like to “keep away” from the use of this key. • Emma breaks her arm trying to climb the tree to get to her sister Jess. Jess is overwhelmed with a sense of guilt as she feels as if this is all her fault. In the poem “Cast”, Jess is delighted when she gets to be the first one to sign Emma’s bright pink cast. Each student will make a paper mache cast and decorate it when they are finished using finger paints and markers. An extension of this activity would involve asking the children to sign their friend’s casts. • In “Trespass”, Emma decides that she will design her own soccer ball using the ball she finds in Jess’s room. Each child will use colored pencil, markers, and crayons along with construction paper to design a soccer ball of their own. • In the poem “Trespass”, Jess describes her feelings as she comes home to find her room in disarray as Emma has trespassed without permission. We will discuss the meaning of the word trespass and provide several examples of what trespassing involves. Each child will write a short paragraph of what trespassing means to them and how it would make them feel if someone trespassed against them. If they would prefer, each child will also be given the option to write about a time they entered their sibling’s room without permission. • In the poem “Family Tree”, Jess has to complete a family tree for homework. She draws branches for her grandparents, parents, her uncle and a “tiny twig” for Emma. A class discussion will ensue as we discuss what it means to be a family along with what a family tree is. Each child is to go home and interview their parents as to their family makeup (heritage, when their parents were born, where etc.). To keep it simple, only the immediate family will be discussed. They are to bring in a picture for each member and create their own family tree listing characteristics associated with each family member as described above. They will present their family tree to the class, presenting 5 students each day. The other students will be allowed to ask questions if they wish regarding the students family traits. • In the poem “Justice”, Jess feels like all of her problems are solved when she is given a key to keep her belongings safe. This act has provided Jess with justice from all of the snooping that Emma has done. There will be a short discussion on what justice means and the class will be assigned to groups of 5. Each group will be given a scenario where someone feels as if they have been treated poorly; each section will have to come up with a “just” plan to make it right. For example, Joey keeps cutting Susie in the lunch line. She has asked him repeatedly to stop, but he does so anyway. What do you think is a fair solution to remedy the problem? Keep in mind, justice is based on compassion and fairness. Your solution must be kind and fair to all people involved. Each group will present their scenario along with their solution at the end. A group discussion will follow discussing how they came up with these solutions and how this assignment made them feel. • In the poem “Telling Time”, Jess shows Emma the clock and explains to her how to tell time. There will be a short minilesson regarding reading clocks. After this lesson, the class will be broken down into groups of two and given a laminated paper clock with adjustable hands. They will also be given a work sheet with eight clocks listed with different times. The first partner is to take the first 4 times and position them on the clock so that their partner can guess what time it is. Once the partner guesses, the one with the clock will write down what their guess was. Next, they will switch roles and the other partner has to guess the time using the last 4 clock times listed on the worksheet. The class will then reconvene as a group, and there will be a small review as to what they learned, what they had trouble with and any questions they may have. • In the poem “Sharing”, the sisters are asked to share a piece of cherry pie. Jess gets to cut it (“so very careful, making sure that both halves are very equal”) as Emma gets to choose the first piece. A minilesson will cover what it means to have “parts of a whole” using a felt cherry pie as an example. Each piece of the pie will be detachable as the concept of ¼, ½, ¾ and a whole is discussed. The teacher will model each faction by taking a piece of pie away from the whole cherry pie. Each group of two will be given a worksheet with 4 blank cherry pies. Each member is to draw a fraction card from the fractions listed above and color in the amount they select on the cherry pie page using a different crayon color for each member. They are to discuss who has the larger piece in each scenario and why. When they are finished, a short review will ensue with the class as a whole. • “Cheating” is a poem that introduces Jess’s frustration with Emma as she cheats on every board game and card game but still seems to lose (according to Jess). Jess decides to teach Emma the hard way with “52-Card Pick Up”. There will be a minilesson review regarding addition before the activity starts. For the game, each pair of students will be given 5 cards that will have numbers on them (2-10-the royals will be taken out). Each member of the group will be asked to randomly select a card, show it to their partner, and then list that number on the blank card worksheet provided for them. After each member has selected a card, they will add the two numbers from the cards together on their worksheet. When the five rounds are finished, the class will discuss any questions or comments they have regarding this addition game. • In the “Collector” poem, Emma loves Jess because she is the only one who can remember all of the names of her rocks that she collects. There will be a small number of rocks introduced to the class along with their classification. Each student will be asked to draw these rocks on their paper and describe their characteristics listing the classification below. • In the poem “Accident”, Emma mistakenly nocks over a potted plant in their home. Soil, pots and small plants will be provided. Each student will plant their own small plant and will be asked to take care of it each day. As an extension, the students will be asked to measure its growth each week and keep a log of what they find along with a chart displaying its growth. • In “Fun with Yarn” Emma creates yarn art in Jess’s room while she is away. As Jess enters the room, Emma describes the mess as a “big spidey web.” A unit on spiders will be introduced along with how they create their webs and why. The students will be asked to make their own spider web using yarn as Emma did. George, Kristine. 2005. Fold Me a Poem. Ill. by Lauren Stringer. Harcourt. George, Kristine. 2004. Hummingbirds Nest: A Journal of Poems. Ill. by Barry Moser. Harcourt. George, Kristine. 2001. Toasting Marshmallows: Camping Poems. Ill. by Kate Kiesler. Clarion. George, Kristine. 1998. Old Elm Speaks: Tree Poems. Ill. by Kate Kiesler. Clarion. George, Kristine. 1997. The Great Frog Race and Other Poems. Ill. by Kate Kiesler. Clarion. Cole, Joanna. 2010. I’m a Big Sister. Ill. by Rosalinda Kightley. HarperFestival. Gaydos, Nora. 2010. Now I’m Growing! I’m a Big Sister-Little Steps for Big Kids. Innovative Kids. Katz, Karen. 2006. Best-Ever Big Sister. Grosset & Dunlap. Greenfield, Eloise. 2009. Brothers & Sisters: Family Poems. Ill. by Jan Gilchrist. Harper Collins Children’s. Janeczko, Paul. 2005. A Kick in the Head: An Everyday Guide to Poetic Forms. Ill. by Chris Raschka. Candlewick Press. Prelutsky, Jack. 2005. Read a Rhyme, Write a Rhyme. Ill. by Melio So. Alfred A. Knoph. Fletcher, Ralph. 2005. 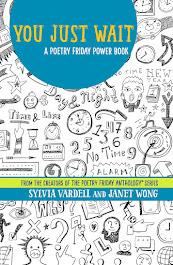 A Writing Kind of Day: Poems for Young Poets. Boyds Mill Press. Fletcher, Ralph. 2002. Poetry Matters: Writing a Poem from the Inside Out. Harper Collins Children’s Book Group. Janeczko, Paul. 2002. Seeing the Blue Between: Advice and Inspiration for Young Poets. Candlewick Press. Kristine O’Connell George didn’t “fall in love with poetry” until 1989 when she attended a poetry writing class at UCLA. In fact, she did not even think about writing until she reached her early 30’s. Now, while living in California with her family, she often finds the inspiration for her poetry everywhere she goes. She is a celebrated author who has received many awards for her work such as the Lee Bennett Hopkins Poetry Award, the Golden Kite, and IRA-CBC Children’s choice award. Due to her outstanding work, she is often speaking at conferences and schools as well as conducting poetry workshops of her own. Nancy was “Emma” in her own family. Nancy Carpenter’s internship as a graphic reporter created much success for her as artwork was first displayed in the New York Times. Since then, she has created several greeting cards and has illustrated over 10 picture books such as Loud Emily by Alexis O’Neill and Little Bear’s Little Boat by Eve Bunting. She is currently living in New York with her husband and two kids. George, Kristine O’Connell. 2011. EMMA DILEMMA: BIG SISTER POEMS. Ill. By Nancy Carpenter. New York: Clarion Books. ISBN 978-0-618-42842-7. In this fun and witty sibling rivalry book of big sister Jessica and little sister Emma, there are thirty four poems in the forty eight pages to help feel the story of what a “big sister does” and what it means to be a “good big sister.” Jessica shares the struggles of dealing with a very energetic little sister in all things fun and whimsical. The poems are light and airy and bring about a strong sense of family ties as well as family dynamics. Working such titles as “Stuff Grownups Say” where Jessica is constantly reminded that she and Emma look like sisters even though Jess “told Emma we got her at the hardware store.” We also learn about the strong bond between siblings, especially sisters in the poem “Emma’s Hands.” In the poem titled “Translator” we learn that only Jess can understand “Emma Language” which goes on to say that “Nostrils are nozzles, calculator is a count-a-lator and Loodle Loos are peaches.” As the book works through its story line we see Jessica and Emma go through a tragic fall and what comes out of it is a stronger bond and a deeper affection for one another. This is a great start to poetry for age’s four to eight. George has a great way of working everyday life issues into the “right words” for a poem. Even something as silly as “Late for School” is fun and interesting with George’s word choice and the illustrations that are used are a wonderful addition to the great poems. Carpenter works the pictures so as you feel you are actually experiencing the mad rush for the bus as Jess does in “Late for School.” You also feel embraced when you hear of Emma’s pet rocks and only Jess is the one who remembers all their names in the poem titled “Collector.” As a big sister myself, I can speak from experience to state that all the things that George writes of are true, Big Sister’s do have a very special job but little sister’s do as well. Working together and for each other is clear in this wonderful book of poems about working together as a team and sharing in life’s lessons. 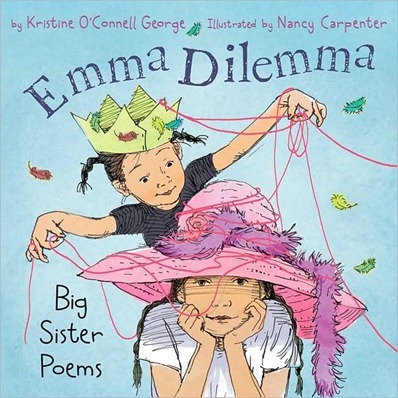 * Association for Library Service to Children/ALA Notable Children’s Books-Nominated Titles for 2011 Annual Conference for Emma Dilemma: Big Sister Poems. Invite children to open-up and discuss the following questions prior to reading aloud Emma Dilemma: Big Sister Poems. *Ask the children who in the group is a Big Sister or Big Brother? * Ask if those children enjoy being a Big Sister or Big Brother? * Ask what things they do to help their little siblings learn how to be a Big Kid? * Ask how they like it when their little siblings follow them around or get into their things or if those things happen at their houses? * Ask them if they have any special stories of being a Big Sister or Big Brother they would like to share with the Group? * Ask them if they have ever watched their little sibling get hurt and wonder if it was their fault? What happened and how did Mom and Dad react? * Divide the room into “Big Sisters and Big Brothers” have each Big pick another classmate to act out the poems “Accident” or “Trespass” and see what the emotions are with the children. Do they see the anguish and pain that Jessica feels when Emma falls or do they understand the meaning of trespassing and what it feels like to have someone “shop” in their personal belongings. * Also have the “Big” Classmates work with their little counterparts on the poem “Emma’s Birthday.” Have a prop of a little stuffed duck to use to illustrate the importance of getting and giving a gift to or from a sibling. This signifies the gift of giving as well as receiving and how importance it is to be polite and caring. * Have the class tell their favorite knock, knock joke – each student should write it out on a 3x5 note-card and present it to the class. Then read aloud the poem “Funny” and see how they respond. Also read aloud “Not Funny” and see the difference in the children, how the mood changes and discuss feelings. * Have each student write a letter to their parents describing their role and placement in their respective families. * Have each student do a book report on their favorite Picture Book. Then read aloud the poem “Picture Books” and discuss why those books are their favorites and how they can use those favorite books to teach their younger siblings about life. * Discuss the meaning of homework and how it can be fun by reading aloud “Homework.” Then have the students come up with a homework assignment of their own using crayons and paper just like Emma. * Have each student put together as simple family tree with the names of their immediate family members. Incorporate this into an Art project by taking that initial information and building upon it to create a Forest of Trees with construction paper, glue, real tree leaves and any other treasures of the woodlands. This will give the classroom or library a great imaginative setting but also illustrate the importance of where we came from and who is part of our family. Read aloud “Family Tree” to illustrate what a family is and how even the littlest twigs make the tree full. * Discuss the meaning of Freedom. What is it and what does it mean to each student? If you could go or do anything, what would it be, where would you go and who would you choose to go with you? Write all this into a personal student journal for reflection at a later date in the semester. * Read aloud the poem “Below” and talk about any tragic events in each students life – has anyone ever broke an arm before? If so how did it happen? Talk about the responses in class and spur discussion. Read through the poems “Hospital” and “Return” and get a gage on how the students react to being in the hospital. Have each student draw a picture of the various people you meet in the hospital and what they do and how they help. * Make fun casts for each student to wear on their arm of choice. Use colored construction paper bound with glue and tape in a cylinder shape around the arm. Ask each student to decorate their cast – and have their fellow students sign it or decorate the casts. Ask the questions – who would you have sign your cast and what would they write? This is a wonderful site about the author and the motivation behind her poems and writings. This site is voted An American Library Association Great Web Site for Kids. This site is very beneficial in that it gives creative ideas for incorporating literature and children – how to make it fun and exciting! This is the review site for Kirkus Reviews. This site gives a great summary of books as well as hits the highs and lows of works with reviews posted in a timely fashion. The site is also great at opening one’s eyes to other works that might be perfect and right in line with your genre of thinking. This site is helpful to find information regarding specific authors or illustrators. Houghton Mifflin Reading is the host and they do a great job at linking important information for the teacher or scholar. This site links you to important information regarding authors, illustrators, publishers and other creators of books for Children and Young Adults. I enjoyed reading the reviews. This blog was a great resource for finding poetry that is new or unpublished. 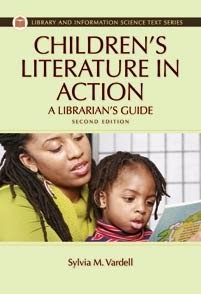 This site features thoughts and opinions on children’s literature. In April of 2011 the blogger featured 30 poets in 30 days. These books are great resources to add into a read aloud experience. I found that the best way to search is to start reading and find the poem that matches or has elements of what you are linking it to. 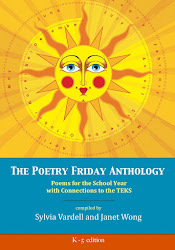 Such as, in Emma Dilemma: Big Sister Poems, the poem “Late for School” is similar to a poem titled “School Daze Rap” by Carol Diggory Shields. 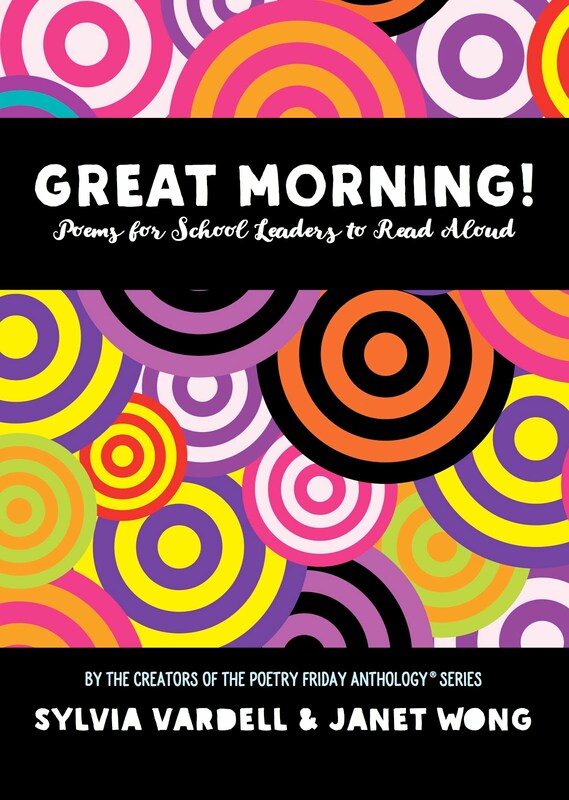 Both poems focus on the issue of the tension related to being late for school and all the obstacles in the way of actually making it on time. Shields, Carol Diggory. 1995. Lunch Money And Other Poems About School. Ill by Paul Meisel. New York: Dutton Children’s Books. ISBN 0-525-45345-8. This book has a great feeling of sibling love and unity. The poems focus on the life of Alfie the big brother to Annie Rose and what he teaches her about life and lessons. Hughes, Shirley. 1995. Rhymes for Annie Rose. Ill. By the author. New York: Lothrop, Lee & Shepard Books. ISBN 0-688-14220-6. This book again deals with the trials and tribulations of taking something that is not yours. Similar to the poem “Trespass” from Emma Dilemma: Big Sister Poems. This poem by Susan Pearson is titled “Who Swallowed Harold?” which is written about an older brother who swallowed a fish that didn’t belong to him. Pearson, Susan. 2005. Who Swallowed Harold? Ill. By David Slonim. New York: Marshall Cavendish. ISBN 0-7614-5193-5. Cleary, Brian P. 2004. Rainbow Soup, Adventures in Poetry. Ill. By Neal Layton. Carolrhoda Books, Inc. Minneapolis: MN. ISBN 1-57505-597-X. Greenfield, Eloise. 2004. In the Land of Words. Ill. By Jan Spivey Gilchrist. New York: Harper Collins Publishers. Shields, Carol Diggory. 2010. Someone Used My Toothbrush, and Other Bathroom Poems. Ill. By Paul Meisel. New York: Dutton Children’s Books. ISBN 978-0-525-47937-6. Waters, Fiona. 1999. Time For A Rhyme. Ill. By Ailie Busby. London: Orion Children’s Books. Kristine O’Connell George says she “fell in love with children’s poetry” in 1989 in a children’s poetry writing class taught by Myra Cohn Livingston for the UCLA Writer’s Program. She has been writing and learning ever since. Her first highly acclaimed book, The Great Frog Race, was published in 1997 which one many awards and honors. On her website she features Studebaker, a gift of a paper mache frog which is a rendering from her book The Great Frog Race. Studebacker travels far and wide with George. He is petted, patted and smothered with kisses at all his gigs. George is a native Coloradan but lives with her family in California where she enjoys the poetry she sees and hears out her back door. Nancy Carpenter’s first job out of college was that of a graphic reporter for a major news service. Her first illustrations appeared in such newspapers as the New York Times. Getting to know art was something Carpenter learned as she worked as a graphic reporter. Her big break came as she was hired to create a book cover. After succeeding in the eyes of the publisher she has been illustrations picture books ever since. She loves to draw dogs but look closely to find her cat illustrated in each book she works on. Used with permission of Courtney Komar and Kendra Caskey. Used with permission of Cynthia Molinar. Two students created projects for Betsy Franco's clever book of shape poetry, A Dazzling Display of Dogs, a wonderful companion book to A Curious Collection of Cats. Leslie Wilson created a digital trailer and Angela Giono developed a readers' guide. Here they are. 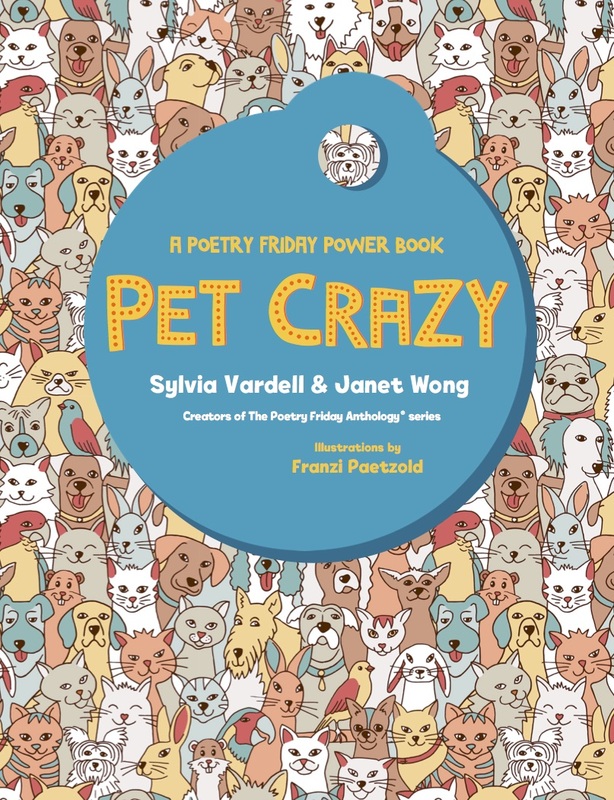 This book is a colorfully illustrated collection of thirty-four witty poems including a haiku about dogs and their antics. It includes such poems as: Lottie on a walk, a garbage eating pooch, a bubble catching dog named Petunia, a dog from the pound, Houdini the escape artist, and a dog peeing on the morning paper. These poems are told through the dog’s perspective. Such as in Circling Poem 2 Coco Circling on the Rug the words are in the form of a circle so the reader can experience what Coco does trying to get comfortable on a rug. • Show the cover of the book ask, what do think of or what pictures come to your brain when you hear dazzling display? Once, answers are shared discuss how the illustrations on the cover either prove or disprove students’ predictions. • Have you ever heard of poetry? What poets or poems have you heard? Have you created your own poetry? • Prior to reading give students an example of a Haiku poem. Do you see a pattern in the poem? If so what is it? This pattern of poem has a name does anyone know what it is? Does anyone know the origin of the Haiku? • Imagine what life is like for a dog. What do you think dogs like about being a canine? What do they dislike? Would you want to be a dog? • If you were a dog what dazzling display would you write your poem about? • Share a story about a dog past or present. What made that dog special or unique? • “Tonka at Dog School,” Students to volunteer for a line-around. Each student will say a dog’s line. Be sure everyone gets a turn to shine. • “Circling Poem 1&2,” Have children act out the poem. One person is the reader the other is the dog. Be sure to take turn. • “Letting Gwen in and Out,” Divide the class into groups. Read the poem in a back and forth way. There is various combinations to reading this poem so experiment. • “Pug Appeal,” Read the students first and then have them repeat with you in unison. • Develop a singing poem from one of the thirty-four given. Perform in music as well as library classes for Don’t Step in the Dog Poop Day-April 25th, International Dog Biscuit Appreciation Day-February 23, National Dog Day-August 26th, or Adopt-a-dog Month-October. 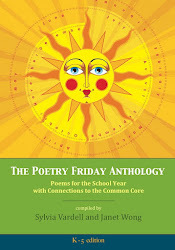 • Students write a poem review of one of the poems in the book. This is strictly opinion, thus it may include positives and negatives. They may also discuss the illustrations. Post on the library website. 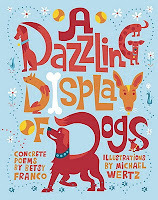 • Students will participate in A Dazzling Display of Dogs illustrated poem contest. Display the participant’s work at parent-teacher conferences. • In this poetry collection, Mimsey Lou is missing. What types of things have you lost? Discuss what information a lost or missing, poster needs to include. For a fun activity have students make a poster for something or someone lost. • Students research report for one of the dogs from Crazy Combo. Students choose a combo-dog or the original breed. Include: personality, feeding, grooming, care, characteristics, and history of the breed. 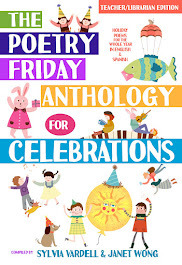 • Have poetry Friday and share poems from A Dazzling Display of Dogs as well as other poetry. • Have students volunteer to participate in R.E.A.D. (Reading Education Assistance Dogs). READ provides dog reading companion for children. The statistics and implementation specifics for this successful program are provided on the website. • After reading the poem Bubbles, discuss how a sphere is the smallest area for its volume of any solid shape. Bubbles try to make the smallest surface. Students can make some basic geometric bubble shapes. The site includes a recipe for bubbles and activity ideas such as making cubical bubbles. • In this poetry collection Miss Olive has a teddy bear. Read Miss Olive’s Teddy Bear. September 9th is Teddy Bear Day. Read the article by the Workshop Rail Museum about the history of the teddy bear. For fun, do some of the games and or activities in the Teddy Bear Day website. (Her blog gives various book reviews by an avid reader and is updated on a regular basis). (This blog includes connections for the poem and the opportunity to view other poets work). (This is a live performance of songs based on the book). (This site gives future book, events, links, and blogging). Franco, Betsy, 2009. A Curious Collection of Cats. Ill. by Michael Wertz, Tricycle Press. Crawley, Dave, 2007. Dog Poem. Ill. by Tamara Petrosino, Woodsong. Hempel, Amy (editor), 1999. Unleashed: Poems by Writers’ Dogs. Three Rivers’ Press. • Day, Alexandra, 1989. Carl Goes Shopping. Farrar, Straus and Giroux. • Bridwell, Norman, reprint 2010. Clifford the Big Red Dog. Cartwheel Books. • Martin, Ann M., 2007. A Dog’s Life: An Autobiography of A Stray. Scholastic. • Wallace, Bill, 2005. No Dogs Allowed! Aladdin Books. • Morey, Walt, 1997. Kavik the Wolf Dog. Puffin. • Pearce, Jacqueline, 2005. Dog House Blues. Orca Book Publishers. • Osborne, Mary Pope, 2011. Magic Tree House Fact Tracker #24: Dog Heroes: A Nonfiction Companion to Magic Tree House #46: Dogs in the Dead of Night. Random House Books for Young Readers. • Kehret, Peg, 1999. Shelter Dogs: Amazing Stories of Adopted Strays. 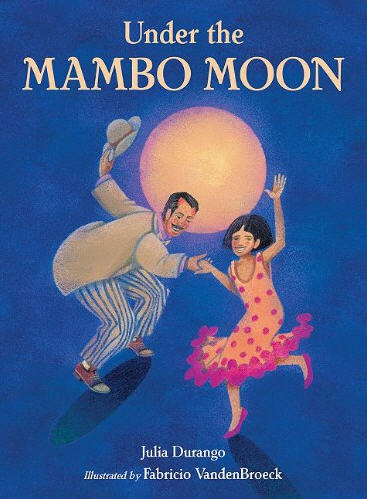 Albert Whitman and Co.
Betsy Franco is the author of over 80 books for both children and young adults. She has received numerous awards and recognition for her work. Used with permission from Angela Giono and Leslie Wilson. 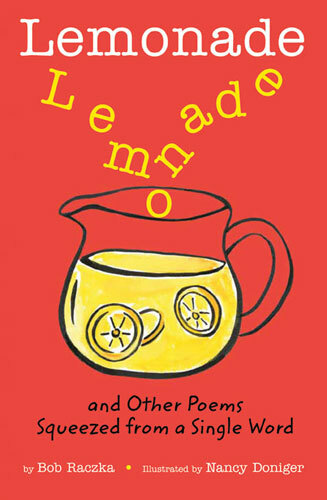 Next, Chandra Burrell offers this very helpful readers' guide for Bob Raczka's newest book, Lemonade and Other Poems Squeezed from a Single Word. Check it out. Bob Raczka has written many books about art and art history for children. He lives in Glen Ellyn, Illinois. Nancy Doniger has illustrated several books for children and done editorial illustration for the New York Times and other publications. She lives in Brooklyn, New York. There are 22 poems that stretch across different themes and they are in no particular order. Raczka makes you think and look at words in a different way since each poem only uses one single word to construct the entire poem. When you first see the poem each letter is under the letter from the main single word to create the poem. It is a poem puzzle that begs to be solved. Some poems are quick and easy while others make you ponder before you turn the page because you want to believe that it is easier than it looks. Then if you finally say I give up the answer is on the back when you turn the page. And truly each poem is simple and powerful because he takes a single word and creates many words that turn into a poem that has depth and layers. Raczka creates a book that showcases poetry in a different way which makes it fun and challenging at the same time. Ask students to look at how the word lemonade is dropping into the pitcher. Now discuss why the author use the word “squeezed” in the title? Look at the Table of Contents and pick out 2 words and have the student imagine what comes to mind when you say those words. Then allow the students to create a list. For example when I think about television I think square, TV shows, cartoons, music video, and cable. Do you think it is easy or hard to write poems that only use a single word as the inspiration? Talk about how Raczka gives an overview of how he discovers one word poems from another author and he gives the other author credit by showing one of his poems. Why is it important to give credit to others? This is a great poem for the whole group to read together while doing exactly what it says to do in the poem. Have students use their hands to go up and down as they read the poem. When hands go up simulate new snow that is about to start again and hands come down they simulate the snow falling down which is a good way to incorporate movement while reading the poem. Divide students into two groups and one group read the first three lines and the second group read the 2nd group of three lines. Also this poem could be read outside while on the playground so that students can act out the play as they read it. Ask the students to be creative by picking their own single word and creating a poem using the single word chosen. In the book the illustrator used simple drawing for the poems. Ask students to visualize what their poem represents. Students will create their own simple drawing for their poems using different mediums. In the book the poems are in columns so have the students use the column method to create their poems. Once they are finish ask students to count the letters used in their poem. Then they can create a graph that shows which letters were used from least to greatest. The data would show which letters are used more when creating the new words from the single word. In the book there are two different poems that focus on minivan and vacation. A great social studies activity would be for the students to pick a destination in the U.S.A. they would like to go on for their vacation. Now have the students find out fun facts about that destination. And for fun the students can try to create another single word poem using the destination as their inspiration. I chose to create a poem about Houston. 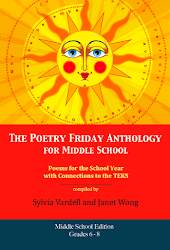 In this book there are two poems that relate to spring and two poems that relate to winter. Have students create a graphic organizer to compare and contrast between winter and spring. Helps students see possible word combination when trying to create one word poems. Type in a word and it gives possible words that come from the primary word. 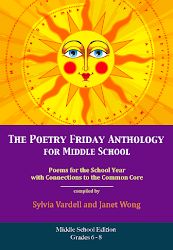 The Booklist review talks about the constellation poem and this is a great to expand students’ knowledge about constellations and stars with this informative and useful website. One of the poems is called “Creative” and Bob Raczka’s website has a link to his favorite place to look at art. That would be a great pair to read the poem then go to the link for The Art Institute of Chicago to look at the same great art. There is great factual information about ladybugs, earthworms, and many other kinds of animals. 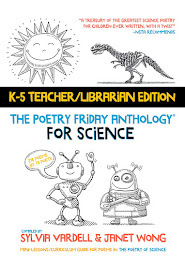 The first two are featured poems so it would be a great way to extend the learning and learn new facts. Raczka, Bob. (2010). GUYKU: A YEAR OF HAIKU FOR BOYS. Ill. by Peter Reynolds. Boston, MA: Houghton Mifflin Books for Children. ISBN 9780547240039. Read the “Treehouse” poem and then can use this book to relate how fun and magical a tree house can be. Used with permission of Chandra Burrell.